a Music Video and a FREE Exclusive Flying Jaquin Mobile! Synopsis: See how it all began, and discover the secret behind the legend of Disney’s new Crown Princess! Frozen in time and trapped inside the Amulet of Avalor for over forty years, Elena has finally found the one, brave princess who can set her free: Sofia of Enchancia! With help from magical flying Jaquins, spirit animal Zuzo, and young wizard-in-training Mateo, Princess Elena must unite her people and battle the evil sorceress Shuriki (voiced by the legendary Jane Fonda) to reclaim her throne. 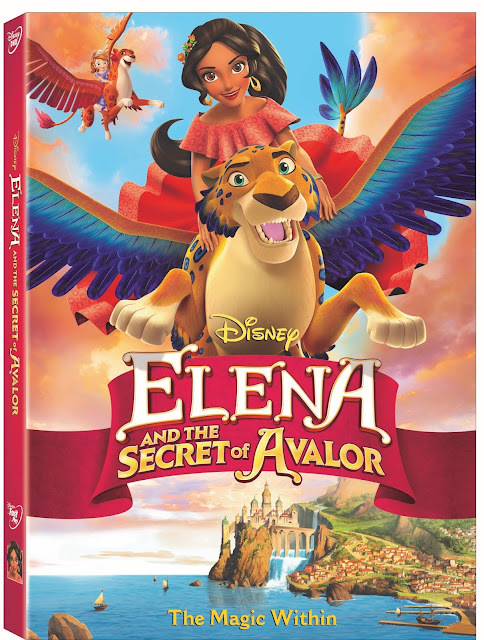 Experience adventure beyond your wildest dreams with the spectacular story of Elena and the Secret of Avalor! Voice Cast: Constance Marie (Freeform's "Switched at Birth") as Doña Paloma; Rich Sommer (“Grey’s Anatomy”) as Captain Daniel Turner; and Lucas Grabeel (Freeform’s “Switched at Birth”) as Jiku.